Are any of you wizards (modders) working on an update on the Misano World Circuit Marco Simoncelli circuit? The one that exists in the Track Database is based on the old layout with the chicane (when it also went in the other direction) and the version that we have now that goes in the current direction has the track markers (corner signs) turned the wrong way. Personally speaking, I've stopped doing any mod-work until Piboso updates/develops his export Mod-tools to work as they should work with the products we can produce direct from professional 3D apps..... When that is done(if it ever will be) then I'll be back modding for GPB again...... Just so much potential that is sadly being held back by apparent bad development priority decisions by Piboso in my opinion. Modding is the life-blood of Piboso's projects and yet the modding tool development apparently is being grossly neglected right now..... It's sad. Maybe Piboso has his good reasons for not developing the MOD-export tools further right now? I don't know because he doesn't tell us these things, so I can only come to the conclusion I have stated above. Hopefully Piboso could enlighten us to his reasons and future intentions/plans for these tools with some kind of approx timeline for any improvement release? It was just a track request, this message was wildly OT. "Obviously your ambition outweighs your talent". Why was it wildly OT Piboso? I was the one who did the Track-Mod David was talking about(unless someone has released a newer version since?). Isn't a track request a MOD work request in your book? Doesn't my statement relate to modding issues/concerns and is therefore valid? Criticism is part and parcel of being a dev, especially when the dev doesn't communicate with their community very well.... Some people never learn it seems. Wouldn't it have been better to have addressed my statement, of which I gave you the benefit of the doubt by saying that maybe I don't know if there could be a good reason for the lack of updates/dev with the mod-tools, rather than throw your dummy out of the pram like this? Treating people like this who have done much Mod work and would like to continue to mod for GPB is just a fools err in my opinion? Great job your doing here.... good luck with that Piboso! Modding tools are like the fifth project, besides GPB, WRS, KRP and MXB. There is no deliberate attempt to avoid working on the modding tools. My problem is not with the tools themselves. My problem is the lack of support for the modders. The information is practically nil. Almost all work is based on trial and error. If this game has as a pillar the modders why there is not a decent support for them? I've been here for a few years and 80% of what I do I've had to find out on my own. I have asked a lot of times without answers about how to get some things (rider animations, personalized skeletons, etc) but I have never been answered. Anyone who wants to start in the world of modding in gpbikes has it really difficult. On the other hand, I have always had the impression that gpbikes is in the background of their priorities and every time I see more people who are unhappy or just gone. Honestly, in part I'm starting to get bored with this. I like doing things more than playing the game. It's more I think I've spent more time doing work than playing. Like Hawk, I think I will be away for a while and come back in the future if the game and support has changed for the better. Well pity the truth ... for a good game of motorcycles that there is and that this way the subject ... perhaps with competition Piboso change of attitude, even that I doubt it ..
Pues que pena la verdad... para un juego bueno de motos que hay y que este asi el tema... quiza con competencia Piboso cambie de actitud, aun que lo dudo..
GP Bikes and the other projects desperately need modding documentation, tutorials and examples. The problem is that, as usual, doing all of that would take A LOT of time. And sadly time is a very scarce resource. Can you name any other sim, made by a small development team, that has great modding tools? Maybe I was wrong about the attitude, I'm sorry if I upset him. But as I understand and taking into account the language barrier for me, I think I have read many times that there are people willing to help but you do not want to. Quizás estaba equivocado en lo de la actitud, lo siento si le molesto. Pero segun tengo entendido y teniendo en cuenta la barrera del idioma para mi, creo haber leido muchas veces que hay gente dispuesta a ayudar pero usted no quiere. If I may suggest, and I know I'm going to get some bad reactions from a couple of guys but that's life, we can't please everyone right, but if I could suggest with all respect to those concerned from a point of sensible sales priority reasons that you put WRS(which let's face it is supported by about 2, 3, maybe 4 people from the evidence here) on hold for the foreseeable future until your other projects are complete(v1.0 releases)? After all, WRS is a free project sold as a side product of buying GPBikes, right? So there will be no come-back from anyone saying they payed good money for WRS and feeling it should be updated on a regular basis, that is if they are reasonable people of course. This would then surely allow you to slot in the work for improving/updating the mod-tools for modders, especially the exporter tool/workflow which, shall I say, is not as user friendly as it could be by a long way(for reasons I and others have pointed out many times in the past), especially for newcomers to modding for your projects? In my opinion, the MOD-Tools, their use and, as Manu has very rightly stated in his post above, the information required to do a good job when modding should be a very high priority only put aside if you have an urgent fix to remedy in your projects. Sales should be uppermost in your priorities and the quality as well as the great number and variety of different mods are what ultimately attracts people to part with their cash to buy your projects. It's the modding potential and your brilliant physics programming that go together to make buying your projects worth the cost in my opinion. Just noticed and read your last post Piboso...... and it seems to me that even after all this time you still don't see the strengths that GPbikes has over any other foreseeable competition, even an upcoming project like BSE? We know your only a small team and you can only do so much within a given time-frame, and this in great respect is what makes us/me so frustrated to know that if only you could give us the tools and information we want then the modding community could make things so much easier for you as far as great quality content was concerned. Then you could concentrate on polishing what you've already done and possibly later updating the visual quality to DX11-12 capabilities, whether you do that with OpenGL, DX or both is up to you. But I think that if you use the time between now and any other potential competitors coming onto the market to just polish up what you already have and get it all working solidly and user friendly then anything else that comes on the market will have a hard time competing, especially long term, with what you already have here with GPBikes. All we're basically asking from you as modders Piboso is to give us the tools and information we want/need to do a great job with the apps we use(and many of us do and can use industry standard pro-apps, we are not amateurs in that respect). First, thanks piboso for the reply and feedback, I know that on the list, physics and netcode are first but man, I've never ever modded a game that supported modding and was as time consuming as your sims, they take a shitload of time of trial and error! And regarding a small game with better support, MX Simulator. 1-Track editor are accessible from the riding area, you are riding a track and want to modify it? Boom, make a jump and try it instantly, it has proper terrain modelling, Decal texturing and oblect placement tools, it takes literally 30 minutes to come with a simple yet cool track. 2-Texturing is just png files, no alpha channel mess and no packing into .pnt, just create a folder and drop the textures there, tbh pnt workflow is nice and I like it but man, documentation, took me 3 hours to try to figure out how to change the stock wheels reflection and normal maps and I failed miserably!!! 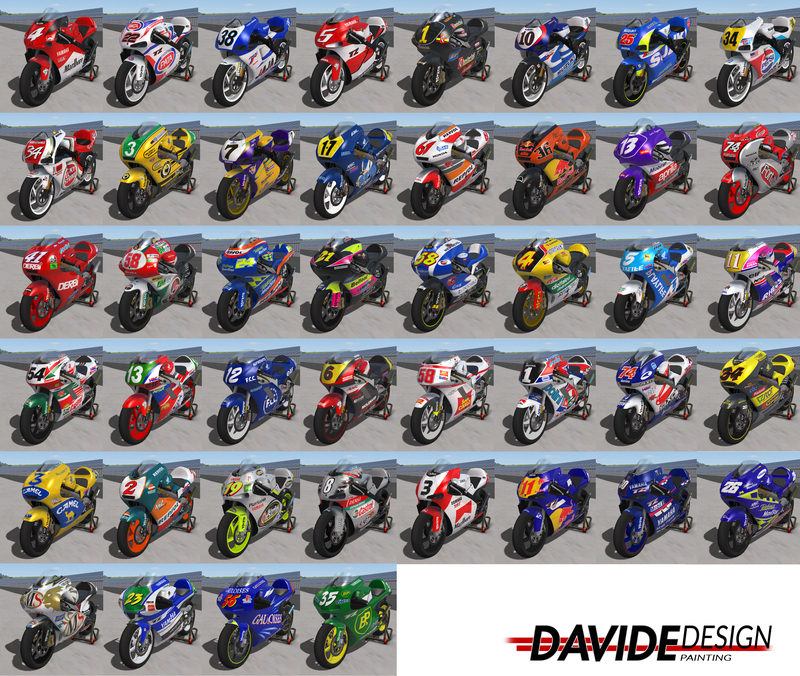 Bike model importing seems to be checked, but please do at least a textures workflow tutorial, a track tools tutorial and a track object import tutorial, something not messy, straightforward and understand able please! I really want to mod but is so annoying and frustrating! Most of my trial-and-error sessions were with things that would only take a line or two in the Track Creation Rules page to clear up. Shaders section - all the example Shinyness values are 6. ...but there's no scale mentioned - So is 6 a minimum? ...a maximum? ...a little? ...a lot? Starting lights section - A note on self-illumination would fit in well there. It only gets mentioned briefly on the MXB(or KRP) forum somewhere. I'd never have heard of it if h106frp hadn't pointed out the post. Texture Animation section - maybe a note on limits. "Animations should be 52 frames or less and you may have up to 6 instancies per part." Notes section - "N-gons should be changed to triangles prior to conversion"
I understand you perfectly. Time is a limited resource. I know they are a small team and that has a lot of merit. But perhaps you could have organized your priorities a little better. For example, the Piboso documentation takes years without being modified / added nothing . Now it would take a huge amount of time to update when it could have been progressively updated as the content appears. If I am allowed the suggestion, I think that a good option would be to release the base content of the game (models, textures, skeletons, animations, etc.) along with the tools. That would save the modders a lot of research time. I also agree with Hawks regarding WRS. Without offending anyone, I think it should be the last of his priorities since it is a product that is offered free of charge. Finally I also want to launch a question. I've always wondered why you did not unify the graphics / physics engine for your 4 projects. Now rFactor and netKar-pro comes to mind. On the other hand, most simulators don't have support for modding. Well I would be good with all of this if I was to get a refund for WRS because I didn't get it free for buying GBP bikes. It was the other way around. WRS being a byproduct of GBP Bikes explains the waste of time on the asphalt cars. WRS had a lot of potential of doing many different types of dirt series and not just oval cars. As far as updates go, WRS hasn't had a real update in a very long time. It still doesn't even have the heat races that were talked about over a year ago. My apologies and I stand corrected in that there are also those that also just bought WRS and got the free key for GPB; I didn't realise that was the case. No offence intended to Piboso or yourself Tirespin, but what the heck are you so concerned about WRS for when you have the likes of rFactor 2 or similar at your disposal? Hard to understand that one.